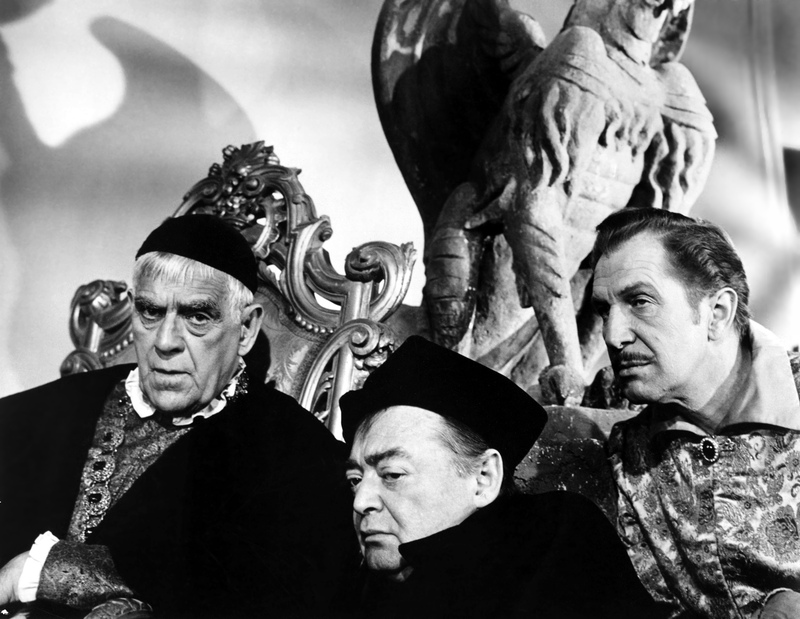 THE RAVEN—–Boris Karloff’s first lines: ” Afraid, my dear? There’s nothing to be afraid of? ” That’s because this is a spoof, or at least that was the idea back in 1963. What once made great kiddie matinée fodder is pretty feeble viewing today, despite the professional scene-stealing from Boris and co-ghouls Vincent Price and Peter Lorre. Lorre takes a sly edge at this: just looking at the guy brings a smile, but even he can’t keep you hooked for 86 minutes. Directed and produced by Roger Corman. Richard Matheson did the script, some was improvised. Beyond the title and Price reciting pieces of the poem, this has nothing to with Edgar Allan Poe, rather, it’s about a group of competing sorcerers who try out their hi-jinks on each other. This results in a mildly amusing magic duel at the finale. The biggest laugh comes from young Jack Nicholson’s hat. Nicholson was 26, and he’s…not very good. .
Hazel Court is the damsel, Floyd Crosby (father of David) did the cinematography. Filmed in 15 days, on a typical Corman shoestring ($350,000) it turned a profit with $1,500,000 and has its coterie of defenders today.